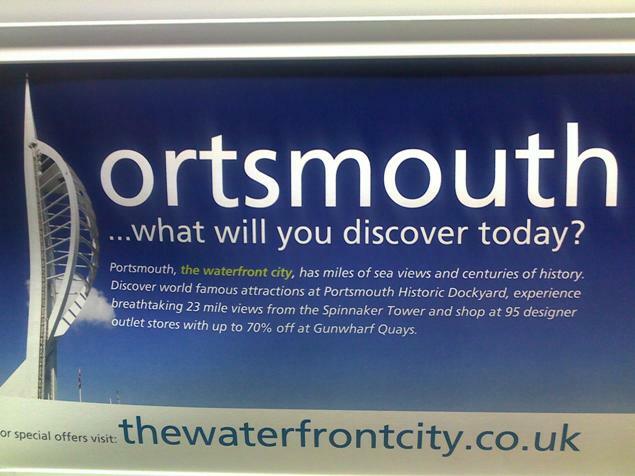 It’s to advertise Portsmouth as a tourist destination. 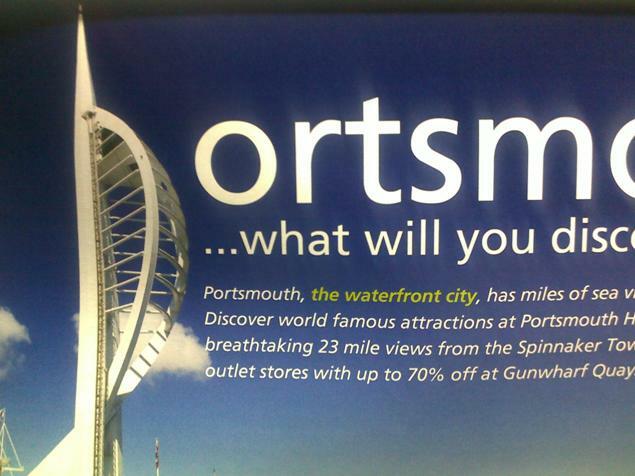 They describe Portsmouth as “the waterfront city”, which considering the fact we live on a relatively small island perhaps isn’t a brilliant way to differenciate one seaside town from any other. 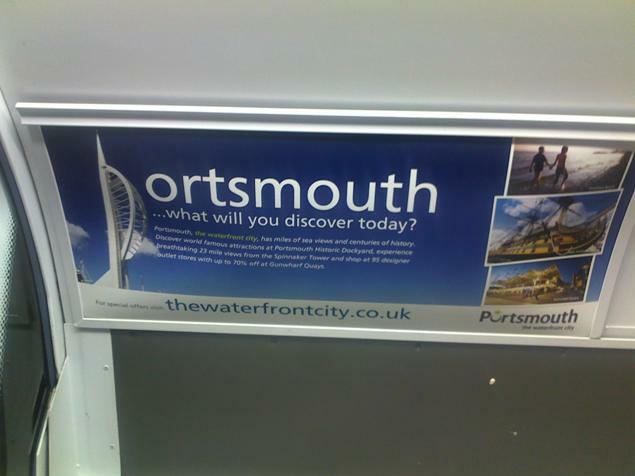 In fact, they don’t really seem particularly confident in the “waterfront city” concept – the URL mentioned in the advert (thewaterfrontcity.co.uk) redirects straight to the Visit Portsmouth website which makes you wonder why they bothered. Soaring 170 metres above Portsmouth Harbour and the Solent, the Spinnaker Tower is taller than the London Eye, Blackpool Tower and Big Ben and has already established itself as a national icon for Britain. A world class visitor attraction, the much-admired, elegant viewing Tower stands proud over one of the most fascinating seascapes in the world. Situated on the waterfront at Gunwharf Quays, it offers amazing 350º panoramic views of Portsmouth Harbour, the South coast and the Isle of Wight, with views stretching out for up to 23 miles – breathtaking by day and a glittering sea of lights by night. It does look a bit like a “P” I suppose, but the positioning of “ortsmouth” next to the tower dilutes the impact in my view. The “ortsmouth” is too high, too far removed from the tower. It doesn’t really read as a “P”. 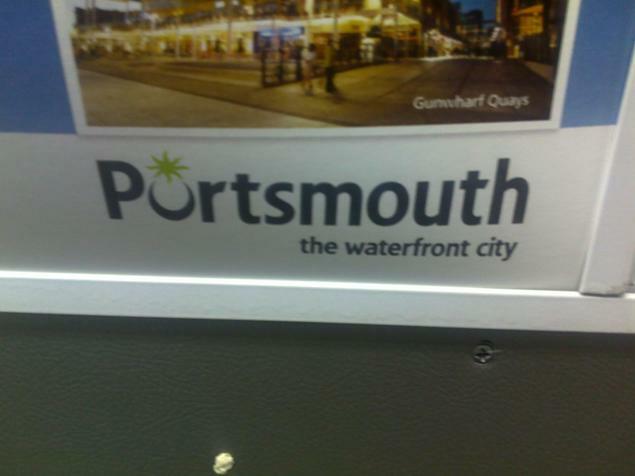 It definitely doesn’t read as “Portsmouth”. It just looks like a picture of a tower and the meaningless word “ortsmouth” floating nearby. Actually, the sun moon is the Portsmouth logo. It’s a waterfront city because the whole city is an island, it’s broken away from the rest on the mainland and only accessible via two bridges which is a pain in the backside when trying to drive to and from work like I used to. Well, as @gillpea says here, surely “the island city” would be a better name in that case. The sun/moon treatment as you describe it is actually partof the City of Portsmouth’s coat of arms. Well that’s what happens when it was meant to be the millennium tower but was so late they had to rename it. Coincidently the glass lift is still not working, having previously trapped people inside on it’s opening journey twice. I’m currently working in pompy and not sure people should really come here for tourism purposes. In his seminal work “Look! Advertising Capitalism” Arteen Rasp asserts that campaigns which aggravate or annoy have 40% more impact on purchasing than campaigns which delight or entertain. His theory led to what copy-writers call “Rasp’s Razor”, which is the principle that poor phrasing, unsatisfactory images and sloppy construction in an advert will attract the attention of opinion forming commentators who – in their criticism – will virally maximise the impact of the campaign. It’s a shame that the only person who noticed it was an idiot like me then. Whee, late to the party! I can’t believe that you and your commenters both missed the best part of the advertising: the claim that the Spinnaker Tower “offers amazing 350º panoramic views”. Can this be true? Is a 10º segment of Portsmouth really unavailable for viewing from the tower? I notice here and on other pages that the 350-degree-view claim is still being made, so I can only assume it’s something that the people of Portsmouth are really proud of.